A vintage wedding ring, that spent a year and a half with the staff of Eurostore on Thomas Street, has finally been reunited with its owner. Karen McCarthy, from Mallow, lost her grandmother’s wedding ring after a shopping trip near Brown Thomas with her daughters last Easter. “When I came home, I searched everywhere for it, and I was so devastated when i I lost it,” she recalled. Karen’s grandmother Kit McCarthy passed away in 2009 aged 103, after receiving medallions from Presidents Mary McAleese and Michael D Higgins. The staff of the store put an advert on Facebook and a sign on the window for over a year; unfortunately, the appeal didn't reach Mallow. While working in Limerick court, the Mallow native made one last attempt to retrieve her ring at the stores of Thomas Street. 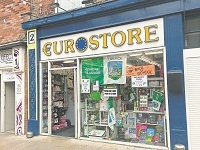 Mary Halpin of Eurostore recalled how she and the staff took extra caution in verifying that Karen was indeed the owner.